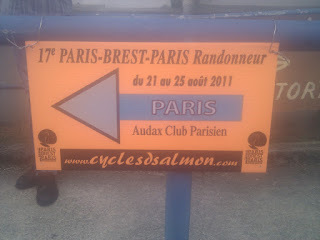 Let me put this straight, I'm not an expert on Paris-Brest-Paris, I only have ridden it once, in 2011. Don't read this as a list of tips you should follow, read it more like this is the list tips Javier wants to remind and apply for PBP. Try to minimize the number of your stops. Each time you stop you lose time so try to minimize the number of stops. Before any stop I play in my mind what I'm going to do at the stop. Say it is a pee stop. Before I stop I plan. I'll stop, get the pee, will remove the rain jacket, will get a sandwich from the bag and will go back on the road. This helps me not only to reduce the number of stops but also to be efficient when I stop. My handlebar bag can easily and quickly be removed and carried. There is where I keep not only the food I plan to eat while riding but also my mobile, money and the brevet. That way when I get to a control with a quick gesture I get the bag and I know I have everything I need with me. Know "your pace". And here a pace is not your average moving speed, it is a wider concept. Pace in this context is your average speed when you factor how often and for how long you need to stop, including sleep. A good approximation of "your pace" is the average speed in your 600 when you consider total time (ie. 600/total number of hours). The whole idea of "your pace" is it should be sustainable, you should be able to keep it for several days in a row. Have a ride plan an then ignore it. Planning PBP means to have an idea of where do you plan to stop, for how long, where do you plan to eat and where do you plan to sleep. I'll be the first to tell you that a mechanical, an error in the navigation, a strong wind and thousand other circumstances will make your plan useless; but the benefit of making a plan is that you'll have to study the route and its profile, you'll have to find out where the controls are and how apart they are, what is the weather forecast, etc, etc. Managing all that information before hand will be very useful when your plan blow in pieces, you'll have better chances of making a good plan on the go an that could make a huge difference. When you get to a control first is get the brevet stamped. Remember when in tip #1 I was saying I plan what I'm going to do when I stop? Well, if I'm stopping at a control the first step is to get the brevet stamped, then you can do the rest (food, bathroom, etc). The only exception to this tip is when I stop in a control where I plan to sleep. If that is the case first step is to secure a bed and then get the brevet stamped. Controls have a limited number of beds and they can run out so better secure a bed and then go to get the brevet stamped, eat something, take a shower, etc. Get a GPS. At PBP he route is completely signed, yes, 1,200 kilometres signed but having the track loaded in your GPS will very helpful if you miss any of the signals. Test all your equipment before hand. If you haven't tested it before don't use it at PBP. Don't use a bike that came straight from the bike shop, make sure you have ridden it a few times before. I apply this to everything, including clothes and spares. Get a bikefit. Ideally before you start the qualifiers. A bikefit will make sure your position in the bike is as good as it can be. This is really important when you are going to spend long hours on your bike. How comfortable you are on the bike is as important than how strong your are, it is amazing that amount of people that don't get this. Make sure your bike geometry have not changed. Unless you live in Paris or you plan to ride to the start you'll have to pack your bike in some way. When you set your bike up again make sure the geometry is correct. Take special care with your saddle and handlebar positions. Be sure you start rested. You can't bank sleep hours but at least make sure you don't start sleep depraved. You'll have to be in Paris on Saturday to get your bike checked and you won't start until Sunday 16:00; that means you have around 24 hours to make sure you start rested. 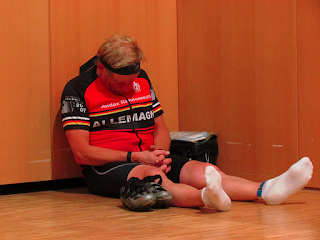 I know there is lots going on around the start on those hours but at least make sure you get a good sleep that night. Make sure you are covered for all weather conditions. If you are British or, like me, used to ride in British weather you are probably going to get this right but in any case have in mind that despite being August and the ride happening in France. The weather in the north and west of France changes a lot so you can have in the same day three hours of rain and three hours of sun. Make sure you are prepared for both. Make sure you have good light. It is really impressive the difference a good light will make on your night riding and in PBP you are going to ride through at least one night. 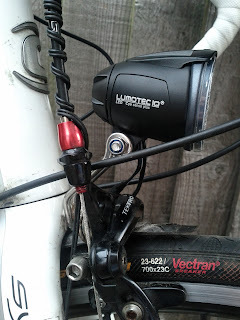 Don't get too hooked on amount of lumens or luxes, good road illumination is more important than brightness, reliability is always a must in long distance cycling and battery durability something to consider very carefully. Make sure you have a backup for your light. I carry a torch on my helmet. I use it to make sure I have a light when I'm not riding and it will serve as backup light if I have any problem with my main light. I wouldn't count on controls to charge your batteries or devices. First because you won't spend that much time at controls and second because controls are normally schools and they don't have that many sockets. Needing a socket to charge a device or a battery is a potential source of stress and problems. Consider either carrying enough batteries to finish without needing a socket or getting a dynamo to power your light and charge your devices. That's what I do. Make sure your bike have mudguards. Again if you are British or used to ride in British weather most likely your bike will have mudguards. If you live in a country where mudguards don't make any sense then make sure you fit them on your bike. 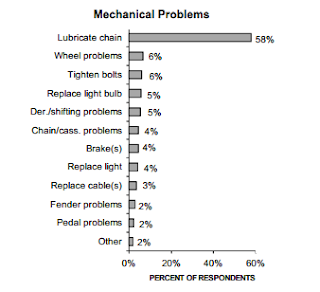 In PBP2007 rained a lot and this study found "that riders without fenders or with only one fender were more than twice as likely to develop problems due to road spray"
Don't carry a backpack. That is weight that goes to your bottom and you bottom already have enough with your weight. What ever you plan to carry on a backpack put it on the bike, use paniars or saddlebags. Get your creams. I use three creams. Vaseline for my lips, sun cream if it is sunny and chamois cream. 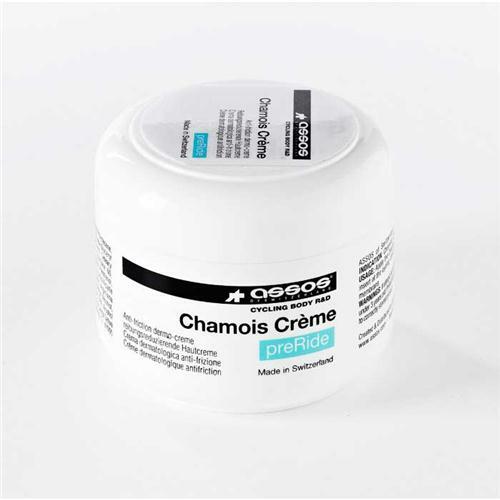 Assos Chamois Créme works perfectly for me. Carry two bottles on your bike. One bottle might be too little if it is too hot and you'll be forced to stop for water too often. I personally carry one bottle of water and one bottle of energy drink and if it is not too hot I can ride 200k with that. Carry baby wipes. They come very useful in lots of circumstances (ie. cleaning your hands after a mechanical) but it could be a live saver when you have to visit the toilet in the third or fourth day. Pedalling in a group is better than pedalling alone. Riding PBP in a group is difficult because it is not easy to get two or more people with the same pace (see tip #2) but don't hesitate in sacrificing speed to ride in a group. By sacrificing speed I mean riding slightly slower or riding slightly faster. Riding in a group will not only be faster overall but also you will get to know people and the ride will be more entertaining. Be ready to ride alone. Even if your original plan is to ride with a group of friends be ready to ride alone. And that means making sure you don't rely on anyone for knowing the route or carrying spares or food. Try to sleep at the controls. In the controls you'll find food, showers, beds and volunteers that will wake you up at the time you designed. But even if you don't plan to take advantage of the beds you'll have to stop at the controls to stamp your brevet anyway. 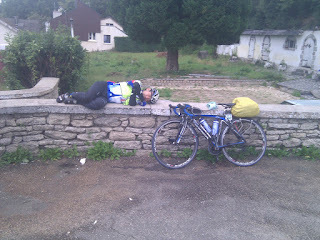 It is better to stop and sleep there than keep riding to sleep in a bus shelter an hour later. Carry ear plugs and a night mask. A control is a lit and noisy place 24x7, even if you plan to sleep in a bed I can assure you that a bedroom with 100 or 100 riders sleeping is not as dark and as silent as you might need to get a good sleep. Ear plugs and a night mask will make a big difference in your rest. Carry enough cash. Nowadays credit cards are accepted almost everywhere but cash is more practical when you are going to be riding through small villages in the French country side. Have also in mind that at controls you'll have to pay for the food (around 9€), the shower (around 3€) and/or the bed (around 4€). Be ready to walk. Not very long distances but the typical control would a school and you be required you to park your bike in a designated area (ie. the school parking), walk to a room to get the brevet stamped (ie. a shool office), then you'll walk to the school lunch room and you probably will need a walk to the toilets. All in all you will doing some walk, have that in mind, depending of your pedals you might want to use cleat covers. I use SPD pedals because I find them more comfortable to walk in, specially if the surface is slippery. Enjoy. PBP is a great experience, make sure you enjoy it. You can find more tips in this post at the yacf forum.